Definition at line 129 of file llselectmgr.h. Definition at line 4803 of file llselectmgr.cpp. References FALSE, mDescription, mDuplicated, mIndividualSelection, mInventorySerial, mName, mObject, mPermissions, mSilhouetteExists, mSitName, mTouchName, mTransient, mValid, LLStringBase< char >::null, saveColors(), and selectAllTEs(). Definition at line 4822 of file llselectmgr.cpp. References i, mAggregatePerm, mAggregateTexturePerm, mAggregateTexturePermOwner, mCategory, mDescription, mDuplicated, mDuplicatePos, mDuplicateRot, mFolderID, mFromTaskID, mIndividualSelection, mItemID, mLastTESelected, mName, mObject, mPermissions, mSaleInfo, mSavedColors, mSavedPositionGlobal, mSavedPositionLocal, mSavedRotation, mSavedScale, mSavedTextures, mSilhouetteExists, mSilhouetteNormals, mSilhouetteSegments, mSilhouetteVertices, mSitName, mTESelected, mTouchName, mTransient, mValid, S32, saveTextures(), and SELECT_MAX_TES. Definition at line 4872 of file llselectmgr.cpp. Definition at line 4996 of file llselectmgr.cpp. References LLPermissions::allowOperationBy(), LLPermissions::allowTransferTo(), FALSE, gAgent, LLPermissions::getGroup(), LLAgent::getID(), LLPermissions::getOwnership(), LLAgent::hasPowerInGroup(), LLAgent::isGodlike(), LLAgent::isGrantedProxy(), LLAgent::isInGroup(), LLPermissions::isOwned(), mObject, mPermissions, LLUUID::notNull(), LLUUID::null, PERM_COPY, PERM_MODIFY, PERM_MOVE, PERM_OWNER, PERM_TRANSFER, and TRUE. Definition at line 4906 of file llselectmgr.cpp. Definition at line 4915 of file llselectmgr.cpp. Referenced by LLSelectMgr::addAsIndividual(), LLObjectSelection::addNode(), LLObjectSelection::addNodeAtEnd(), LLObjectSelection::cleanupNodes(), LLObjectSelection::contains(), enable_buy(), enable_save_into_inventory(), enable_save_into_task_inventory(), LLSelectMgr::findObjectPermissions(), LLSelectMgr::generateSilhouette(), LLObjectSelection::getFirstCopyableObject(), LLObjectSelection::getFirstDeleteableObject(), LLObjectSelection::getFirstEditableObject(), LLObjectSelection::getFirstMoveableNode(), LLObjectSelection::getFirstMoveableObject(), LLObjectSelection::getFirstObject(), LLObjectSelection::getFirstRootObject(), LLObjectSelection::getFirstSelectedObject(), LLManipTranslate::handleHover(), LLManipTranslate::handleMouseDownOnPart(), LLFloaterOpenObject::moveToInventory(), LLFloaterInspect::onClickCreatorProfile(), LLFloaterInspect::onClickOwnerProfile(), LLObjectSelection::is_root_object::operator()(), LLObjectSelection::is_valid_root::operator()(), LLObjectSelection::is_root::operator()(), LLObjectSelection::is_valid::operator()(), LLObjectSelection::is_non_null::operator()(), LLSelectMgr::overrideObjectUpdates(), LLSelectMgr::packBuyObjectIDs(), LLSelectMgr::packDuplicate(), LLSelectMgr::packMultipleUpdate(), LLSelectMgr::packObjectCategory(), LLSelectMgr::packObjectClickAction(), LLSelectMgr::packObjectDescription(), LLSelectMgr::packObjectID(), LLSelectMgr::packObjectIDAndRotation(), LLSelectMgr::packObjectIDAsParam(), LLSelectMgr::packObjectIncludeInSearch(), LLSelectMgr::packObjectLocalID(), LLSelectMgr::packObjectName(), LLSelectMgr::packObjectSaleInfo(), LLSelectMgr::packPermissions(), LLSelectMgr::processObjectProperties(), LLSelectMgr::processObjectPropertiesFamily(), LLSelectMgr::promoteSelectionToRoot(), LLPanelPermissions::refresh(), LLPanelInventory::refresh(), LLSelectMgr::remove(), LLObjectSelection::removeNode(), renderOneSilhouette(), LLManipTranslate::renderSnapGuides(), LLManipRotate::renderSnapGuides(), LLSelectMgr::saveSelectedObjectTransform(), LLSelectMgr::selectHighlightedObjects(), LLSelectMgr::sendListToRegions(), and sitting_on_selection(). Definition at line 4897 of file llselectmgr.cpp. References FALSE, mObject, and mTESelected. Referenced by LLObjectSelection::applyToTEs(), LLObjectSelection::contains(), getLastSelectedTE(), and LLSelectMgr::remove(). Definition at line 142 of file llselectmgr.h. Definition at line 5090 of file llselectmgr.cpp. References d, f, gAgent, gCamera, LLAgent::getAvatarObject(), LLSelectMgr::getBBoxOfSelection(), LLAgent::getCameraPositionGlobal(), LLViewerCamera::getDefaultFOV(), LLFrameTimer::getElapsedSeconds(), LLBBox::getExtentLocal(), getObject(), LLCoordFrame::getOrigin(), LLViewerCamera::getPointOfInterest(), LLViewerObject::getRenderMatrix(), LLViewerObject::getRenderPosition(), LLSelectMgr::getSelectionCenterGlobal(), LLCamera::getView(), LLPrimitive::getVolume(), glBegin, glBlendFunc, glColor4f, glEnd, glFogf, glFogi, glMultMatrixf, glPopMatrix, gSelectMgr, i, LLDrawable::isActive(), LLViewerObject::isHUDAttachment(), llclamp(), LLVector3::magVec(), LLViewerObject::mDrawable, LLVOAvatar::mHUDCurZoom, LLMatrix4::mMatrix, mSilhouetteExists, mSilhouetteNormals, mSilhouetteSegments, mSilhouetteVertices, LLVector3::mV, LLColor4::mV, S32, LLSelectMgr::sHighlightAlpha, LLSelectMgr::sHighlightThickness, LLSelectMgr::sHighlightUAnim, LLSelectMgr::sHighlightUScale, LLSelectMgr::sHighlightVAnim, LLSelectMgr::sHighlightVScale, LLSelectMgr::sRenderHiddenSelections, t, v, VBLUE, VGREEN, and VRED. Definition at line 4933 of file llselectmgr.cpp. References i, mObject, mSavedColors, LLPointer< Type >::notNull(), and S32. Referenced by LLSelectNode(), and LLSelectMgr::saveSelectedObjectColors(). Definition at line 4946 of file llselectmgr.cpp. References mObject, mSavedTextures, and LLPointer< Type >::notNull(). 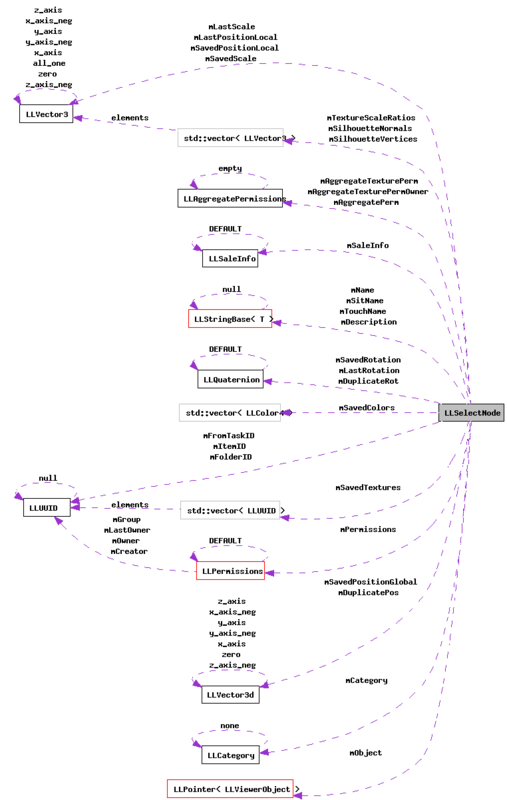 Referenced by LLSelectNode(), and LLSelectMgr::processObjectProperties(). Definition at line 4960 of file llselectmgr.cpp. References LLTextureEntry::getScale(), LLPrimitive::getTESTAxes(), LLTextureEntry::getTexGen(), i, mObject, mTextureScaleRatios, LLVector3::mV, LLPointer< Type >::notNull(), s, t, LLTextureEntry::TEX_GEN_PLANAR, and v.
Definition at line 4878 of file llselectmgr.cpp. References i, mLastTESelected, mTESelected, S32, and SELECT_MAX_TES. Referenced by LLSelectMgr::addAsIndividual(), LLSelectNode(), and LLSelectMgr::updateSilhouettes(). Definition at line 4887 of file llselectmgr.cpp. References mLastTESelected, mTESelected, and SELECT_MAX_TES. Referenced by LLSelectMgr::addAsIndividual(), and LLSelectMgr::remove(). Definition at line 4928 of file llselectmgr.cpp. Definition at line 141 of file llselectmgr.h. Referenced by LLSelectMgr::addAsFamily(), LLSelectMgr::addAsIndividual(), LLSelectMgr::convertTransient(), and LLToolSelect::handleObjectSelection(). Definition at line 159 of file llselectmgr.h. Definition at line 160 of file llselectmgr.h. Definition at line 161 of file llselectmgr.h. Definition at line 164 of file llselectmgr.h. Referenced by LLSelectNode(), LLSelectMgr::processObjectProperties(), and LLSelectMgr::processObjectPropertiesFamily(). Definition at line 181 of file llselectmgr.h. Definition at line 163 of file llselectmgr.h. Referenced by LLSelectNode(), LLSelectMgr::processObjectProperties(), LLSelectMgr::processObjectPropertiesFamily(), LLPanelPermissions::refresh(), and LLHoverView::updateText(). Definition at line 173 of file llselectmgr.h. Definition at line 174 of file llselectmgr.h. Definition at line 175 of file llselectmgr.h. Definition at line 177 of file llselectmgr.h. Definition at line 178 of file llselectmgr.h. Referenced by enable_save_into_task_inventory(), LLToolsSaveToObjectInventory::handleEvent(), LLSelectNode(), and LLSelectMgr::processObjectProperties(). Definition at line 153 of file llselectmgr.h. Referenced by LLSelectMgr::addAsIndividual(), LLManipTranslate::handleHover(), LLSelectNode(), LLObjectSelection::is_valid_root::operator()(), LLObjectSelection::is_root::operator()(), LLSelectMgr::promoteSelectionToRoot(), and LLSelectMgr::updateSilhouettes(). Definition at line 165 of file llselectmgr.h. Referenced by LLSelectNode(), LLSelectMgr::processObjectProperties(), and LLPanelInventory::refresh(). Definition at line 176 of file llselectmgr.h. Referenced by enable_save_into_inventory(), LLSelectNode(), and LLSelectMgr::processObjectProperties(). Definition at line 167 of file llselectmgr.h. Referenced by LLManipTranslate::handleHover(), LLSelectMgr::overrideObjectUpdates(), and LLSelectMgr::sendListToRegions(). Definition at line 172 of file llselectmgr.h. Referenced by LLSelectMgr::overrideObjectUpdates(), and LLSelectMgr::sendListToRegions(). Definition at line 170 of file llselectmgr.h. Definition at line 193 of file llselectmgr.h. Referenced by getLastSelectedTE(), LLSelectNode(), selectAllTEs(), and selectTE(). Definition at line 162 of file llselectmgr.h. Referenced by LLFloaterPay::give(), LLObjectMute::handleEvent(), LLSelectNode(), LLFloaterOpenObject::moveToInventory(), LLPanelObjectTools::onClickSetBySelection(), LLFloaterPay::payViaObject(), LLToolPie::pickAndShowMenu(), LLSelectMgr::processObjectProperties(), LLSelectMgr::processObjectPropertiesFamily(), LLPanelPermissions::refresh(), LLFloaterOpenObject::refresh(), LLFloaterBuyContents::show(), LLFloaterBuy::show(), and LLHoverView::updateText(). Definition at line 191 of file llselectmgr.h. Referenced by allowOperationOnNode(), getObject(), isTESelected(), LLSelectNode(), saveColors(), saveTextures(), saveTextureScaleRatios(), and setObject(). Definition at line 157 of file llselectmgr.h. Referenced by allowOperationOnNode(), enable_buy(), enable_save_into_inventory(), LLSelectMgr::findObjectPermissions(), LLSelectNode(), LLFloaterInspect::onClickOwnerProfile(), LLFloaterPay::payViaObject(), LLSelectMgr::processObjectProperties(), LLSelectMgr::processObjectPropertiesFamily(), LLFloaterBuyContents::show(), LLFloaterBuy::show(), LLHoverView::updateText(), and ~LLSelectNode(). Definition at line 158 of file llselectmgr.h. Referenced by enable_buy(), LLSelectNode(), LLSelectMgr::processObjectProperties(), LLSelectMgr::processObjectPropertiesFamily(), and LLHoverView::updateText(). Definition at line 182 of file llselectmgr.h. Referenced by LLSelectNode(), saveColors(), and LLSelectMgr::selectionRevertColors(). Definition at line 168 of file llselectmgr.h. Referenced by LLManipTranslate::handleHover(), LLSelectNode(), LLManipTranslate::renderSnapGuides(), and LLSelectMgr::saveSelectedObjectTransform(). Definition at line 166 of file llselectmgr.h. Referenced by LLManipTranslate::handleHover(), LLSelectNode(), and LLSelectMgr::saveSelectedObjectTransform(). Definition at line 171 of file llselectmgr.h. Referenced by LLManipRotate::dragConstrained(), LLManipRotate::getObjectAxisClosestToMouse(), LLSelectNode(), and LLSelectMgr::saveSelectedObjectTransform(). Definition at line 169 of file llselectmgr.h. Referenced by LLSelectNode(), and LLSelectMgr::saveSelectedObjectTransform(). Definition at line 183 of file llselectmgr.h. Referenced by LLSelectNode(), saveTextures(), and LLSelectMgr::selectionRevertTextures(). Definition at line 188 of file llselectmgr.h. Referenced by LLVOVolume::generateSilhouette(), LLSelectNode(), and renderOneSilhouette(). Definition at line 186 of file llselectmgr.h. Definition at line 187 of file llselectmgr.h. Definition at line 185 of file llselectmgr.h. Definition at line 180 of file llselectmgr.h. Referenced by LLObjectEnableSitOrStand::handleEvent(), LLSelectNode(), and LLSelectMgr::processObjectProperties(). Definition at line 192 of file llselectmgr.h. Referenced by isTESelected(), LLSelectNode(), selectAllTEs(), and selectTE(). Definition at line 184 of file llselectmgr.h. Definition at line 179 of file llselectmgr.h. Referenced by LLObjectEnableTouch::handleEvent(), label_touch(), LLSelectNode(), and LLSelectMgr::processObjectProperties(). Definition at line 155 of file llselectmgr.h. Referenced by isTransient(), LLSelectNode(), and setTransient(). Definition at line 156 of file llselectmgr.h. Referenced by enable_save_into_inventory(), enable_save_into_task_inventory(), LLObjectEnableSitOrStand::handleEvent(), LLToolsSaveToObjectInventory::handleEvent(), LLObjectEnableTouch::handleEvent(), label_touch(), LLSelectNode(), LLObjectSelection::is_valid_root::operator()(), LLObjectSelection::is_valid::operator()(), LLSelectMgr::processObjectProperties(), LLSelectMgr::processObjectPropertiesFamily(), LLPanelInventory::refresh(), LLSelectMgr::saveSelectedObjectTextures(), sitting_on_selection(), and LLHoverView::updateText().